Lynn Winters offers CranioSacral therapy at practices in Blue Hill and Stonington. Orthopedic therapist Lynn Winters is well versed in how the body adapts to pain, and what steps to take to cure that pain. 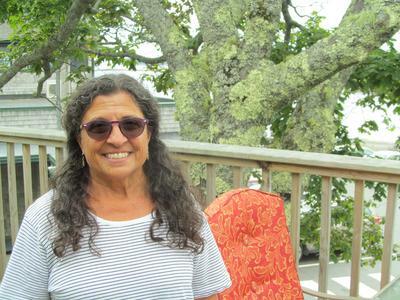 With 40 years of OT experience, and 15 years of experience in the alternative therapy method of CranioSacral therapy, Winters recently started practicing in the Blue Hill and Stonington communities after moving to the area in June of 2017. Winters and her husband started visiting the area five years ago during the summer months. During that time, the couple made the decision to eventually make the move. Winters made the preemptive decision to work one day a week in the summer while she was visiting, to get her name out for when she was eventually practicing here full-time. Winters said she “fell in love” with CranioSacral therapy after attending a workshop with a coworker several years ago. She dove in head first, and now enjoys offering it to people as an alternative to massages or chiropractic work. CranioSacral therapy is a gentle, hands-on therapy that works with the central nervous system, including the soft tissue and fluids that surround and protect the brain and spinal cord. It works to release restrictions and tensions in the body that cause pain and dysfunction and allows the body to use it’s own abilities to return to health. A typical session lasts about an hour, said Winters, and the work is very light to the touch. “It’s different from a deep tissue massage in that the weight is about the weight of a nickel,” she said. Winters said she likes to do three sessions with a patient, each a week apart, before deciding what the next steps should be in terms of treatment. Some people continue to go back on a prescribed basis, while some use it simply for the health benefits once a week. Winters is currently practicing in Stonington at the old school building in room 1E, and in Blue Hill with a cooperative of wellness practitioners called Healthy Living Center, at 1 West Lane. Winters’ hours are 8 a.m. to 5 p.m. on Mondays in Stonington, and from 9 a.m. to 5 p.m. on Tuesdays in Blue Hill. The hours are flexible to fit people’s needs, she said, and she hopes to eventually expand to Wednesdays in Blue Hill and Fridays in Stonington.